My house is NOT the house next to the fish, do not be ringing my neighbours' door bell unless you want to be very unpopular! 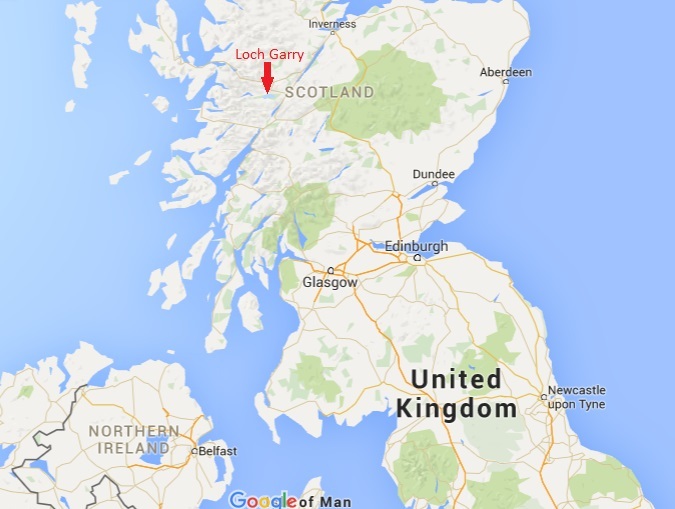 If you have Google Maps on your phone just look for "Loch Garry Fishing". Please please please put this in your phone before getting lost as you will struggle to get good reception when you are near. From Invergarry head towards the Isle of Skye for approx 5 miles then turn left along the loch on the single track road sign-posted for Tomdoun / Kinloch Hourn. 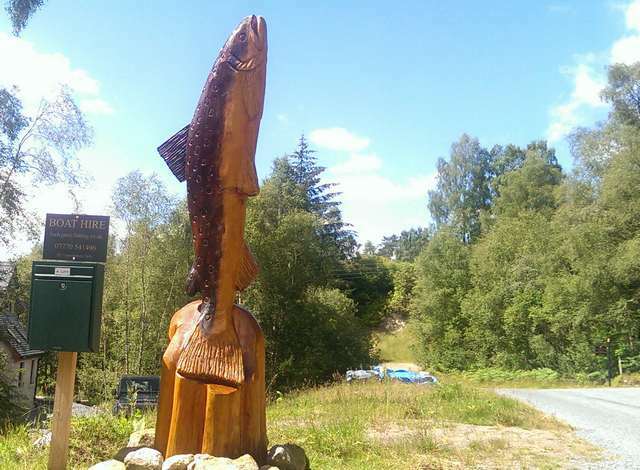 Continue along the single track road for approx 5 miles until you see the wooden fish carving and turn left down the track for approx. 100m and please park by the large wooden deer gate and ring my door bell. There is a sign "Fishing Parking" with some bright orange buoys. Regarding Google Street View, unfortunately this is not of my premises, I have contacted Google dozens of times however they clearly don't care about providing accurate information. Fishing takes place in an environment that is potentially dangerous. It is the responsibility of all those hiring a boat to act at all times with the safety of themselves and others foremost in their minds. 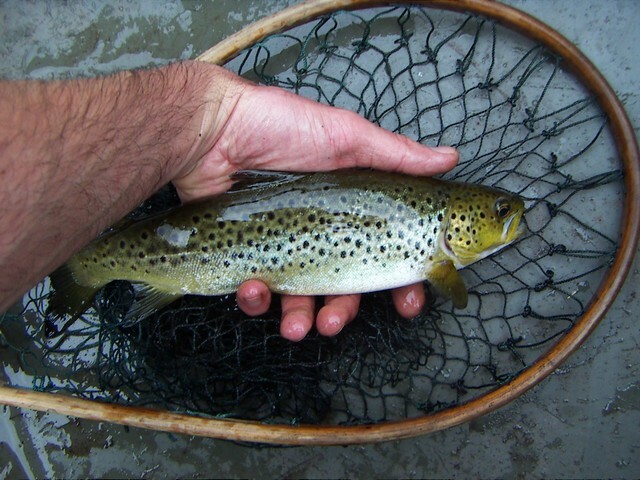 Loch Garry Fishing nor the owner will accept any liability for material damage or personal injury or death sustained in the conjunction with or prior to, during, or after hiring a boat. Life jackets or bouyancy aids will be provided and should be worn at all times on the water. The ratio of supervising adults to children who are not strong competent swimmers must be one to one. Whilst Loch Garry is a freshwater loch it is a large, deep and sometimes wild body of water therefore depending on the weather no guarantee of availability can be given for safety reasons, any money paid will be returned if the weather is too wild. Look for the "Fishing Parking" sign at my gate and ring my door bell. After seeing myself you can then drive down to the boats, the track is now improved and any vehicle can get down including motor homes etc. 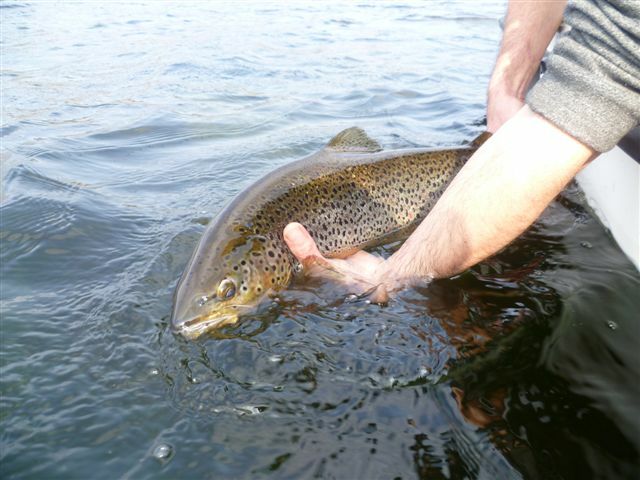 By hiring a boat you agree to release all fish more than 45cm in length. The unhooking mat provided is 45cm wide. 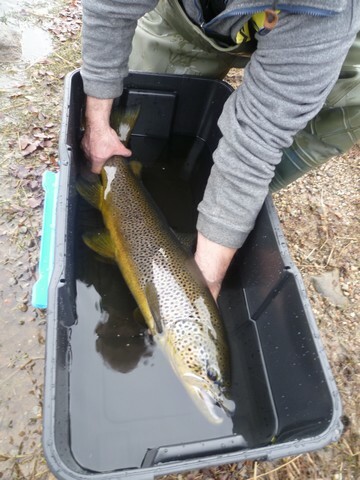 When releasing a fish it is important the following is done, firstly make sure your hands, knotless net and the provided unhooking mat are all wet and also that you spend plenty of time holding the fish in the water allowing it to recover. 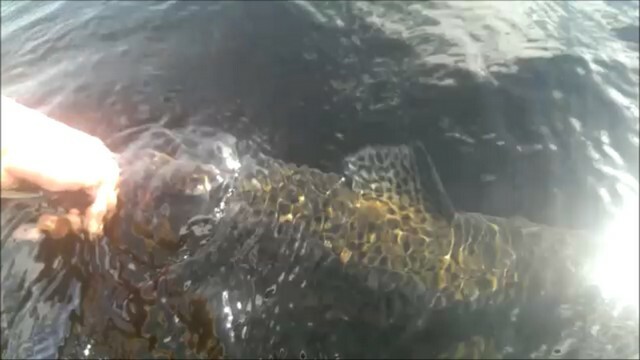 Watch for bubbles coming out of its gills, by gently tilting the fish from one side to the other under the water you will allow air to escape from its gills and only then should the fish be released. If you wish to use my tank pictured above please ask, it really is a fantastic way to keep fish happy and healthy. All my fish are put straight from the net to the tank and then the photographing etc means that they are only out of the water for seconds which means they swim away very strongly and is a wonderful thing to watch. It is my opinion that if you intend to release fish it is only sensible and fair to the fish to use barbless hooks. Loch Garry is designated as a Site of Special Scientific Interest. 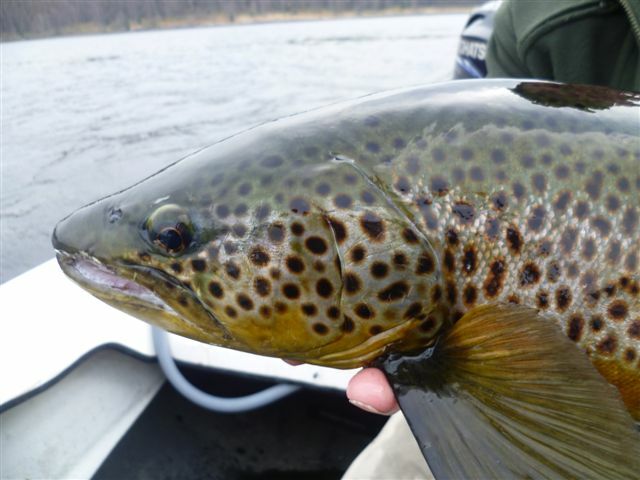 This means to fish in one of the most beautiful places in the world and to enjoy the wildlife of the area fishers will be informed of the importance of not disturbing certain areas around bird nesting season. For this reason three bays in Inchlaggan are out of bounds to boats from the 15th of April to the 31st of July. I am afraid I am unable to launch other people's boats/canoes/other craft etc so please don't ask. I have one pair in size 6, 8, 10 & 12 in both wellies and thigh waders, these are free for customers to borrow. It is helpful if you tell me if you need to borrow these at the time of booking so I can have everything ready for you. Please think about this because if you book both boats and 6 people turn up all wanting size 10 then clearly that is a problem and you wont be going out on my boats. There is no jetty so you will not be allowed to go fishing in shoes. I am unable to help with bank fishing, I only deal with the boat fishing rights. PLEASE NOTE THERE IS NO JETTY SO WELLIES AT THE LEAST, IDEALLY WADERS ARE ESSENTIAL TO GET IN AND OUT OF THE BOATS. PLEASE MAKE SURE YOU HAVE READ THIS WEB SITE BEFORE CALLING!